OK, guys, so the daunting sewing machine has been pulled out of the box, and the instruction manual has been studied cover to cover...several times; each time, referring to the legend of labeled parts. 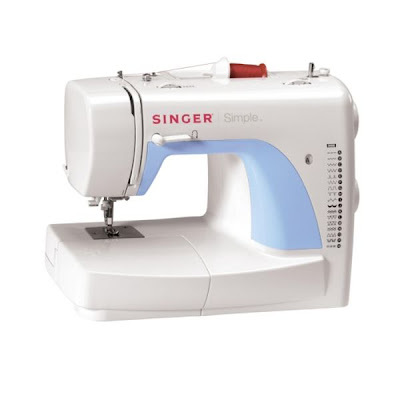 I got this Singer Simple machine from Sears...worst customer service employee ever, who was saved by adorable grandma sewing expert employee who helped me make the right purchase and explain the features to me! But, it has been done! I have transferred thread from a hand sewing spool to the proper, and included, bobbin; and I have loaded bobbins of thread into the bottom and top of the machine. And let me tell you, successfully following the, like, 8 step tutorial for threading the machine is quite the small victory! Not small. HUGE! GO ME!! I also used the automatic needle threader, which, in theory is an awesome time saver, but I could only get it to work 1 out of the 5 times I tried, so I just hand threaded the needle the second time. So here it is! 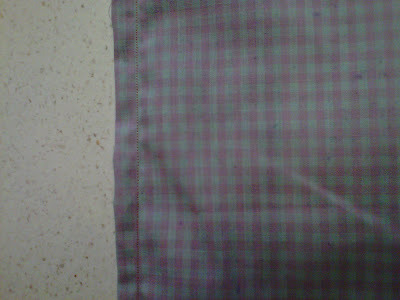 My first machine-sewed seam. I just folded an edge over on some ugly, dye-attempted fabric to use for practice, and sewed straight up the edge, and then turned corners just for the practice. My next practice project will be to sew a little pillow! Also, I need to buy different thread, because this hand-sewing one-layer thread I have keeps breaking, and I am convinced it is not my fault! So, there you have it! Both Christmas gift domestic items have now been used...and I think the sewing machine might be more successful than the crock pot already, but we are still holding out hope on that.